These gave me a dilemma. I knew that they were really just Montrail Namches with a Gore-Tex liner, which is a good thing. But in the past Montrail had made the Gore lined Stratos and the Cirrus models which, as comfy as they were must have been among the most returned retail items ever produced. They would split and leak in the same place, flex points built in seemingly with the single purpose of tearing the shoe open. But the upper on the Hardrock Mid has none of the daft plastic bits, cutouts and flex points that would spell disaster. The Namche design is adapted here, but not too much. There’s a bit more protection to the mesh areas that I shredded when scrambling with the Namches, the overall shape is the same, the sole unit is the same, the heel is the same. I stuck them on my feet and headed out. The fit is perfect on me, and there seems to be a little more toe room than the Namches had. The upper is supple, but not soft. The sole flex is the same, just right. The grip is familiar, I did coast for quite a few feet on some mud but otherwise I knew they were going to hold onto most stuff to the point of me skipping over a boulder field on the tops of greasy rocks without thinking about until afterwards. I think the black section on the sole may be a little harder than on the Namches, but as that was super soft rockshoe rubber I think I’ll allow that for the sake of a little more longevity. I was in them all day and I didn’t have an issue. I used the supplied basic insoles and wore a pair of dogeared Bridgedale Ventum Light Hiker socks. I’m not even going to try and fake objectivity here, I absolutely loved them. If they upper holds together and if the Gore-Tex liner stays intact I think I’ll have found “my” poor weather lightweight footwear. Not winter though, the upper won’t take it. I’m looking to the AKU Slopes to get me above the snow line. I’ll come back to them later, I’m hoping we’ll be firm friends. I’ve worn all the Montrails sent out now, and early indications are that it’s looking good. This makes me happy, it’s like finding my favourite Judas Priest t-shirt from the Glasgow Apollo gig in ’83 down the back of my cupboard and then discovering I didn’t really cut the sleeves off it and it still fits. This entry was posted in Items Various and tagged gear. Bookmark the permalink. Aye, in ’83 when they played it was Helix and Heavy Pettin. ’83-’84 was a classeic time for Apollo gigs. It still seems like yesterday. Good grief, could you imagine. There would silence in the audience and then I’d be asked politely to leave. I’d probably make a scene and knock over folks glasses as they dragged me out the door shouting… “Aye, you! Yer wife wears trail shoes!…Get aff me…An’ yer sister wears them tae!!…”. Any idea how I can get a pair ? Old grumpy puss Craig cant get me them ! Be perfect for WHW next week as forecast is rain and I am not sure Namche’s will cut it ! Christ, is that next week you’re away? Footprints is the best option I can think of. It just depends on time, I don’t think there’s any minimum orders for Montrail. And, there is stock in all sizes in France. Aye leave Fort Bill next Friday ! You’ll be gritting your teeth into a storm for 96 miles…that’s the way it should be. Footprint were as usefull as a chocolate fire gaurd ! Ordered them from states on tinternet so hopefully they will be here for next week. You free before I go for a quick pow wow just to pick yer mind ! Maybe I should get you to write it up for me so its a bit more eloquent ! Comms next week and we’ll try to get a cuppa meet. My first advice is “athletic tape is handy”. My Hardrocks finally arrived from the states !!! Whoopee only thing is I cant go and get them dirty ! They really are a shadow of the Namche so it will be interesting to see how durable the liner is. The liner is the thing isn’t it? I really hope it doesn’t die on it’s arse in the first couple of months. I adore the new Montrail shoes, all of them. I’m liking lightweight mids a lot and was somewhat hoping you’d be able to extend there use into winter but I was a little saddened by your ‘not winter’ comment. Haven’t you worn Highlanders above the snow line on a wintery Ben Nevis trip before? Or am I mistaken? Also how would you rate the Hardrocks in general compared to the Salomon’s would the Salomon’s fare better in winter or do these mid plimsoles just not cut it and it’s Ice Bugs only? And what about these mysterious other Montrail Mids that you said are going to be the direct Namche replacement? Which have a very similar looking sole unit (in fact general look) to the Namche/Hardrock but slightly changed. Where have they gone to, or are they a summer ’09 release? I take it they’ll be unlined like the Namche and aimed at the Namche’s intended area of use? And to bobinson, who did you order from and how much did they cost to import? Were you stung by import tax? Or is it better to wait and see if they ever get a release over here? Ah so many questions… but I do hope Montrail have come good again in terms of quality. The highlanders have a beefier upper than the mids, and will take the abrasion of going through crusty snow better (they’re grippier too). Well, probably I’ve just been wearing the Hardrocks in the snow in Glen Coe last night and this morning (more later…) and they did well. The snow was quite soft though. The unlined versions went on limited release to a US retailer recently and hopefully we’ll see them all over in spring ’09. Mids are fine in winter for most ground, I had a couple of slippy moments though. I’ll get the Salomons out in similar conditions asap and report back. You can order the Hardrock Mids through any UK Montrail dealer. If they can be arsed, that’s the only sticking point. Don’t let them tell you there’s a minimum order for 12 pairs or some shite like that, there isn’t. I genuinely love all the shoes Montrail sent. The only thing I’m watching for now is durability. Montrail Stratos durability – yes! Awful! Glad it wasn’t just me. I trashed my first pair of Stratos in 115k of walking. Both split right across the undersole and then started to come around the top as well. I reckon it was only the Gore liner holding the toes on! 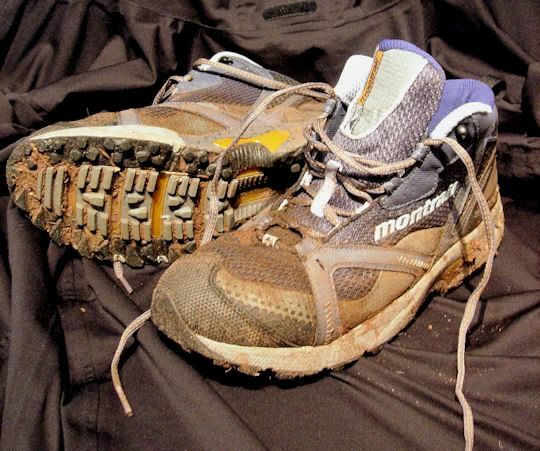 A new pair of Montrails was duly exchanged at Outside with no fuss (can’t recall what model they are at the moment). But I’ve not had them on my feet for even five minutes outside since the season changed and I was away bounding about like a spring lamb with the glorious Terrocs. I don’t relish the weight and restricted movement that even the Montrails represent when compared to the Terrocs – but I’m not sure that wandering about in the snow with them is losing more than I’d gain. I’m getting used to swapping shoes all the time, and the difference between the Inov* X-Talons and almost anything else still catches me out. It’s the one shoe that takes me cloest to that bare-foot feeling. Unfortunately, previously lightweight things start to feel clumpy in comparison. I was looking for them in Belgium. I found Stratos and took the opportunity to check my size. It seems that they fit small, I have to take 1/2 size up compared to Asics running shoes. I would like to order the Hardrock online. – do they fit the same size than the Stratos? – do you recommend the Namche (still available online) or Hardrock – or should I have two pairs, one with GTW one without? Tks! Your site is great – it motivate people to go outside, even if it’s -10°C! The Stratos are tighter on the toes than the Hardrocks at the same shoe size. Other wise they feel the same, the Stratos had a lot of returns as the upper was splitting at the front flex point. If they’re at a sale price might be worth a gamble? I still like the Namches. I think the fit is a little slimmer than the Hardrocks. A bit like they’ve allowed room in the Hradrocks for a thicker sock as they can be used in autumn/winter more as they’re waterproof. To be honest, I like them all, but it’s always what fits best! Good luck and thanks, it’s always great to share all the stuff on here.